It's almost Valentine's Day - one of my favorite occasions for whipping up an extra special treat! But I have to confess that I'm just not into adding about 1,000 drops of food coloring to any given combination of butter and sugar in order to make something that looks Valentine's Day appropriate. What I really love is being able to celebrate the holiday by giving my husband and son something that's distinctive from the usual 'hearts and candy' fare, something that's thoughtfully made to truly nourish their hearts and souls. 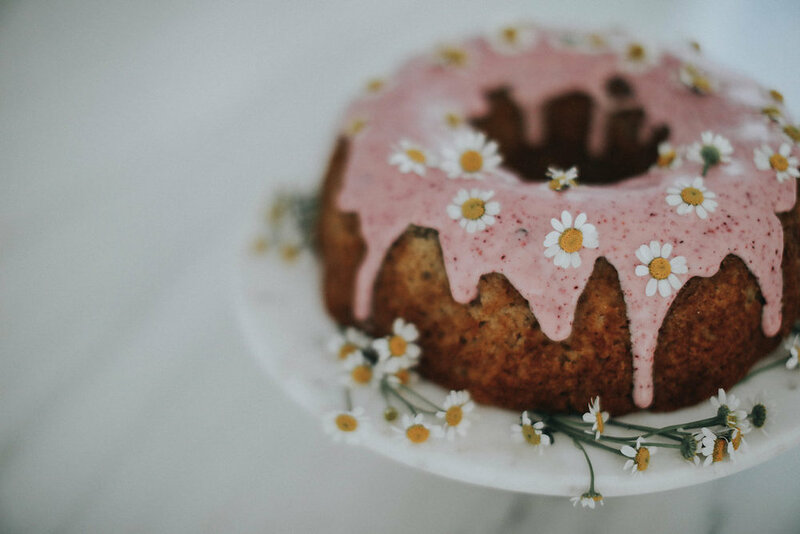 So this year, I turned to a couple of farm-fresh ideas to make a simple pound cake into a heartwarming Valentine's Day dessert. First, I added a little touch of hibiscus powder (Yep- hibiscus! 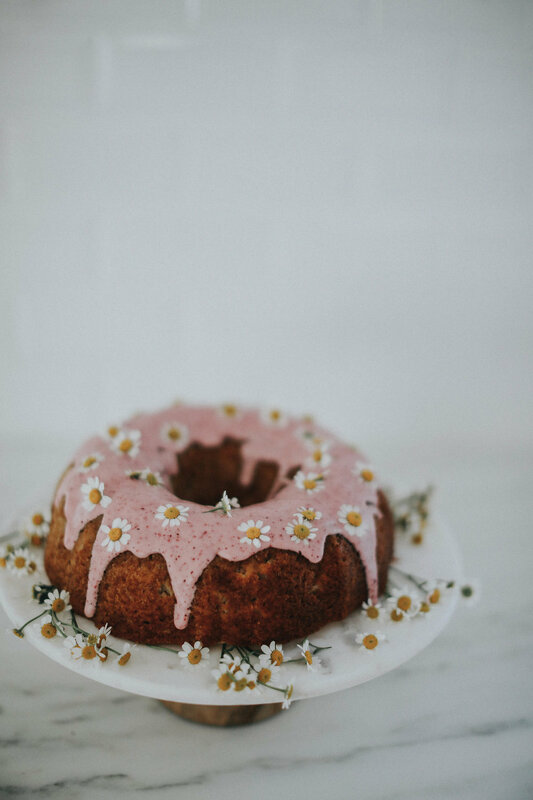 I get mine from Stock + Spice) to this cake's glaze to make it perfectly - but naturally! - pretty in pink. Not that you need more reasons to eat a slice or two of this delicious cake, but here's a little article about the health benefits of hibiscus. Then, forgoing the expected candy hearts or red hots I opted to sprinkle on a few tiny fresh blossoms. These might be chamomile flowers, or maybe some type of asters... Hmmm... please comment below if you happen to know what they are! I think they're so dainty and sweet. They make this cake just right for a modern farmhouse Valentine, don't you think?! In a medium bowl whisk together the flour, baking soda, salt, and cardamom.Adjust an oven rack to the middle position, and preheat the oven to 325F. Grease and flour a 10-inch Bundt pan.In a stand mixer fitted with a paddle, cream butter and granulated sugar together until light and fluffy, 2-3 minutes.Add the eggs, one at a time, and beat until incorporated, scraping down sides of the mixing bowl as needed.Add 1T vanilla and mix on low to combine. Add the 1/3 of the flour mixture, and mix on low speed until just combined.Add the sour cream and mix until the batter is just combined. Add another 1/3 of the flour and mix on low to combine.Add 1/2 c heavy cream and mix until the batter is just combined. Add the remaining flour, and mix on low until just combined.Use a spatula to scrape down the bowl and make sure the mixture is completely combined.Pour batter into the prepared pan and use a spatula to even out the topBake the cake for 60-75 minutes or until a toothpick comes out clean.Move the cake to a wire rack with a piece of parchment underneath the rack, and let cool for 15 minutes.Invert the cake onto the rack.While the cake is still warm, pierce all over with a long skewer or a fork. For glaze, mix together the powdered sugar, 1 T vanilla, 1/4 c heavy cream, and the hibiscus powder. Apply glaze to cake with a pastry brush or drizzle on with a spoon. Let the cake cool before slicing/serving. 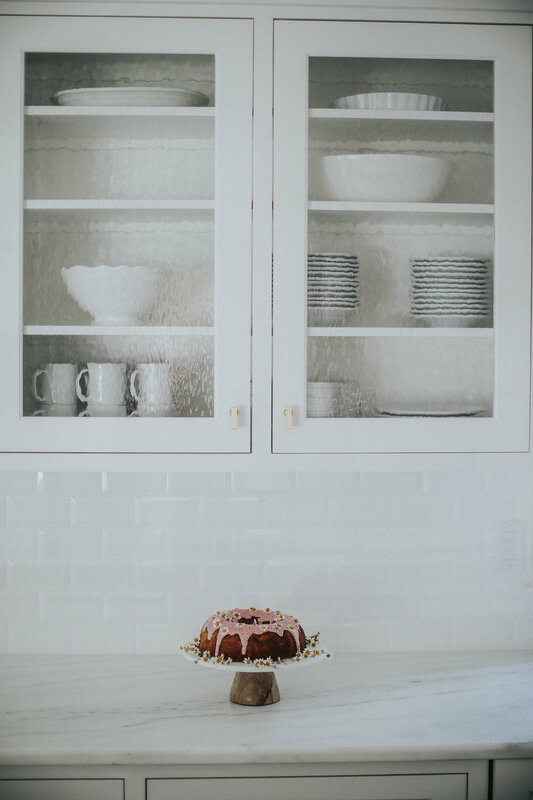 If you make this cake for your Valentine, snap a pic, post it on Instagram, and tag us @teaselwooddesign. It's so fun for us to see you using our ideas!